Apple: sweet pastry topped with apples. Apple and raspberry: sweet pastry topped with apples and raspberries. Pumpkin: sweet pastry topped with a pumpkin mash. 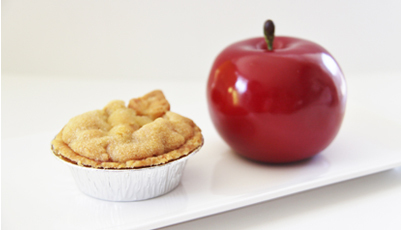 Our mini pies are made without the top 10 food allergens, are gluten free and completely vegan. An exquisite filling cupped by a sugar pastry, our mini pies are brimming with flavors and lightness.